Blue Sky Financial Planning / Blue Sky Blogs / Is deliberation an English trait? Is deliberation an English trait? If you blinked, you may have missed it? St George’s day was this Monday just gone. Not a date that is widely celebrated. In fact, we English seem to be deliberating over whether we should get behind the day, just not bother or celebrate something else entirely. Some just don’t care as long as they get another public holiday! Perhaps the date is better known for Shakespeare’s birthday? The Royalists amongst us, from now on, may remember the date more for the arrival of a royal baby? Congratulations to all concerned. St George’s Day is also known as ‘The Feast of Saint George’; the feast day of St George as celebrated by various Christian Churches and by the several nations, kingdoms, countries and cities of which St George is the patron saint. St George’s Day is celebrated on 23 April, the traditionally accepted date of the saint’s death. St George, according to legend, was a Roman soldier of Greek origin and an officer in the Guard of Roman Emperor Diocletian, who was sentenced to death for refusing to recant his Christian faith. 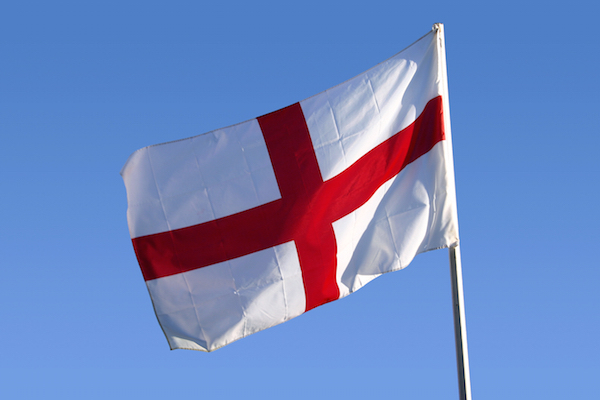 A traditional custom on St George’s day is to fly the St George’s Cross flag. Unfortunately, the flag is better known these days for being draped around drunken English football fans who masquerade it as their badge of honour. You’ll see the evidence between 14th June and 15th July this year during the World Cup… but if past performances are anything to go by, it will be seen mostly in the first couple of weeks! I think it’s fair to say there is a mixed reaction to St George’s day. Some want to celebrate it more, like English Heritage. Jeremy Corbyn has promised a public holiday if he gets into power. Others have called for St George to be replaced as the patron saint of England on the grounds that he was an obscure figure who had no direct connection with the country. Sounds like a nation struggling for identity, then deliberating about what others think far too much. What’s this got to do with money you might be thinking. What’s the relevance to Blue Sky? My simple message is don’t be typically English when it comes to your financial well-being and the life you want to lead. Decide what you want, plan on how you are going to get it and don’t focus on what others think. It’s your life. Get in touch if you want help flying your flag.